Jazzy, just turned 1.5 years. We love this doodle and so does everyone that sees her. Her coloring is beautiful, coat is soft and smooth, perfect size for an indoor dog (miniature). She went through training easily and is well behaved. 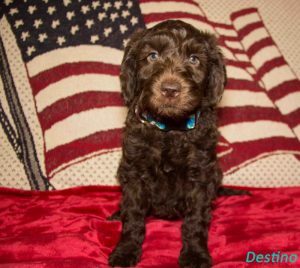 Serenity Springs is a great Labradoodle breeding facility and Jo is very helpful in getting you and your Doodle off to a good start. 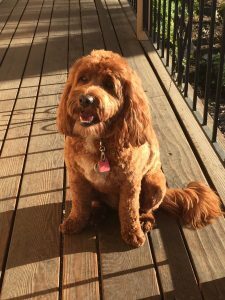 She is also very willing to answer questions after purchase and is always interested in how you and your Doodle are doing. I could not give Serenity Springs a higher recommendation.